Most recently a paper was published in Physical Therapy in Sport (Herrington, 2013) and the findings of this paper along with our other work on Q angle (Herrington and Nester, 2004) are going to form the core of this discussion. What is the Q angle? The Q or quadriceps angle describes the line of pull of the quadriceps muscle. This angle is formed by the intersection of two lines: one drawn from the anterior superior spine to the mid-point of the patella and the other from the mid-point of the patella to the tibial tubercle (figure 1). Why might it be relevant? Well, because the patella (knee cap) is embedded in the tendon of the quadriceps muscle, and the direction it moves in is dependent on the line of pull of the quadriceps. If the line of pull is not parallel to the orientation of the femoral trochlea (the groove the patella runs along), it is likely the patellar surface is not going to be loaded evenly because of its poor alignment going through the groove - which could cause stress and tissue damage. Why isn’t the picture that clear in the literature? The concept appears to be straight forward - the greater the Q angle, the greater the relative pull of the patella laterally (outwards not just upwards), so the greater the potential asymmetrical or uneven loading of the patella, stress and pain. But unfortunately within the research literature the relationship between patellofemoral pain and Q angle is not that straight forward, with literature demonstrating and failing to demonstrate a link with equal measure. The first potential measurement error comes from assuming the patella is to be found in the middle of the knee. Often people with patellofemoral pain present with laterally positioned patellae (Herrington, 2008), so assuming the patella is in the middle of the knee in this group would be incorrect. Further when Q angle is re-calculated taking this displacement into account as we did in our paper (Herrington and Nester, 2004) this significantly increases the Q angle in these individuals. The second major measurement error often seen is that Q angle is frequently measured whilst the subject is standing on two feet. In our recent paper (Herrington, 2013) we found that in normal people their Q angle decreases when measured standing on two then one leg, and it does so in a predictable manner. What we also found was that in patients with patellofemoral pain this relationship did not occur, when standing on one leg their Q angle was always significantly greater than it should have been as defined by our predictive equation from normal subjects. What does all this mean for Q angle? 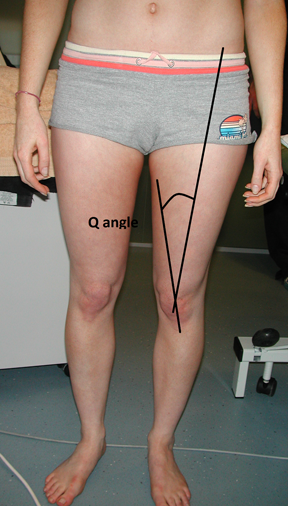 When measuring Q angle, it is worth considering the relative position of the patella and how this affects the value (Herrington & Nester 2004) and the effect of standing on one leg (Herrington, 2013). In taking these two factors into account it is likely that your Q angle will be larger than expected and might be having a significant influence on your patellofemoral pain.